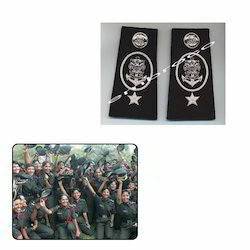 WE are well known manufacturer & supplier of Shoulder Badge for Indian Army. These badges are widely used in Indian Army. These are highly appreciated by our valuable clients. We specialize in manufacturing, exporting and supplier different types of Shoulder Badgefor Indian Army. With the help of our talented team members, we have been able to offer Shoulder Badges exact as per the specifications of our clients. Knowing the exact demands of clients, we manufacture our products in different designs, colors and patterns. Looking for Shoulder Badge for Indian Army ?